For 5000 years people have been bathing in man-made pools of water. The ‘great bath’ of Pakistani city, Mohenjo-daro, was the earliest public water tank in the ancient world and set in motion a luxurious desire to rest, relax, unwind and relish in the azure liquid, while soaking up the hot summer sun. For five millennia not much has changed. We still value the tranquillity and relaxation that a swimming pool offers, and the luxury of owning one's own private water retreat is still considered a lavish and opulent asset. Swimming pools have since taken many forms, from the Greek and Roman baths, to the first ‘modern day’ pool built in 1920s America. Most of us will have some memory of 80s style kidney bean-shaped pools that saved us during hot summers and provided countless childhood memories. In the last decade pools have transformed from the typical rectangle into architecturally designed places of sumptuous serenity. Peruse the following well-designed examples of different swimming pools that will undoubtedly elicit envy, and allow yourself inspiration to create your own piece of aquatic heaven. Who says a swimming pool has to be a standard rectangular affair? Pools situated against architecture create a space that is intriguing, and evoke a sense of ‘island’ living when inside the home. This is a perfect example of creating a body of water alongside a house and letting the water ‘in’. Moreover with an expansive view of the pool from within the lounge space, the water can creep around the side of the house into a water feature. Coupled with the deep, rich hue of this pond-like pool an essence of mystery is created within the indoor and outdoor space. 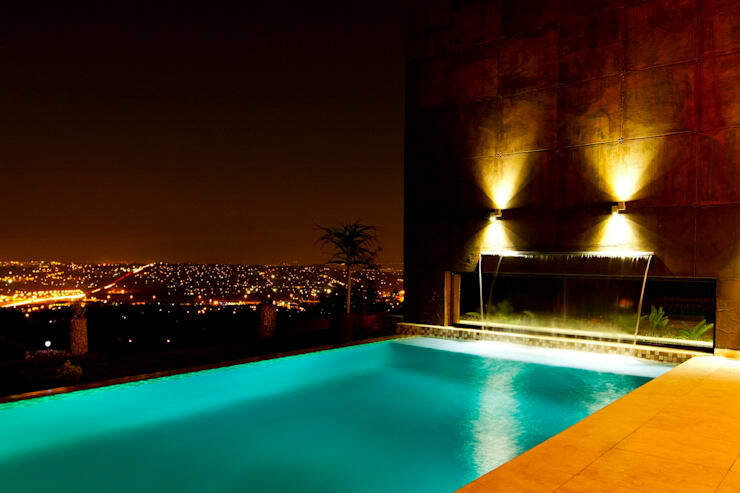 A pool without borders, this is the ultimate in luxurious living—the infinity pool, one of Hollywood mansions and 5 star getaways, this examples proves how opulence and lavish pools can exist within one's own home. If you are lucky enough to possess a plot with a view, consider a pool whose side barriers appear to drop away and create a sense of connection with swimming pool and the view beyond. A spa in your very own home, this excellent swimming pool has everything you could ever require and more. 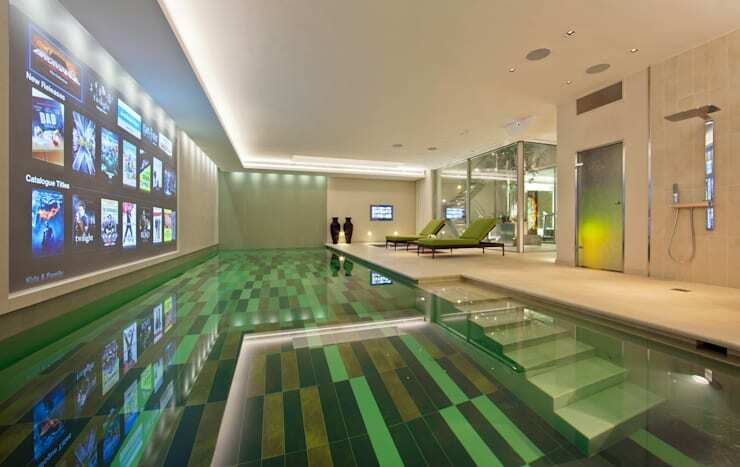 Tiled in a mixture of green tones, this space looks more like a luxury 5-star hotel than an indoor residential pool. If you are looking to create a spectacular scene within your abode, then look no further than this example—giant projector screen displays blockbuster films while your swim, or you may simply want to relax on a banana lounge and soak up the steam. While the space is set up for numerous activities, it also has the practicalities of an indoor swimming pool; it is long enough to accommodate lap swimming and has a smart open shower to the right to ensure you are rinsed well before entering the main house. This is sophisticated and technologically flashy architecture at its best. If a giant swimming pool cinema is not your cup of tea, consider this lovely ‘back to basics’ bathing space that creates an innate sense of calm and tranquillity. 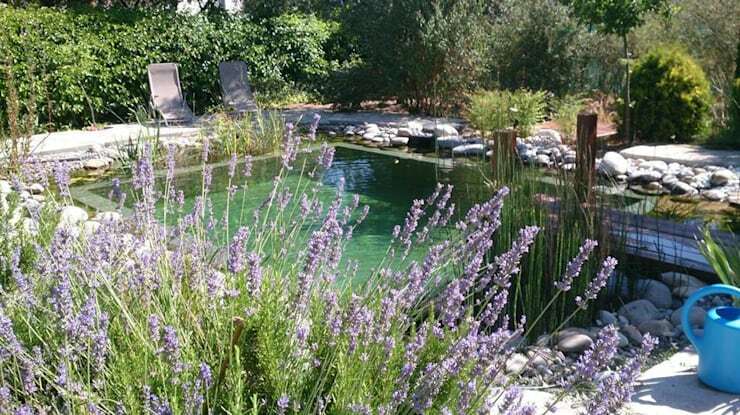 Set in natural surroundings, this wonderfully organic pool is banked by lavender and native plants ensuring it settles in with the environment and becomes a part of the space without feeling jarring or conspicuous. 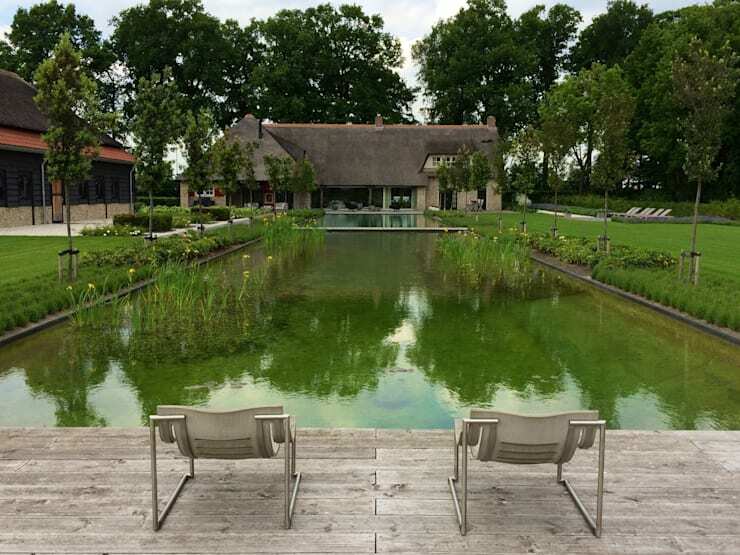 Another wonderful use of water is this glorious garden and swimming pool combination—set up with the swimming pool near the dwelling; the body of water then extends a great distance into a pond-like water feature incorporating natural plants and maximising the view from the home. Combined with a raw timber deck and a pair of sun chairs, this excellent space incorporates many different elements to create a space that is stylish and sympathetic to the natural environment.